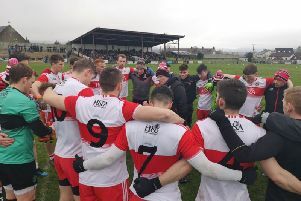 Derry manager Damian McErlain admitted his preparations for this weekend’s trip to Waterford are likely to be severely hampered by players’ midweek involvement in the Sigerson Cup. The likes of Shane McGuigan, Niall Toner, Michael McEvoy and Karl McKaigue will all be in action for their universities ahead of the trip to Fraher Field and having lost Enda Lynn to a hamstring injury against London, McErlain admitted his squad is already being tested by the heavy schedule for players. 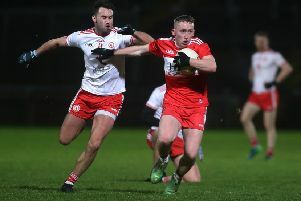 “It is not ideal, it’s a bit of a disaster to be honest,” explained McErlain after Sunday’s victory, “We lost Michael McEvoy and Conor McCluskey as options today because they are playing for their club in a club tournament. Michael will also be playing for his College during the week so it is far from ideal. Despite the testing schedule, McErlain said he was expecting to see his players at training this week ahead. “We will be expecting them together at some stage during the week, one way or another,” he added, “Our season has to go on as well. “The Colleges have their thing to do, and clubs have theirs, but we have to get our own house in order here too. “That’s right and it’s not just Michael McEvoy. You have Shane McGuigan, Niall Toner and others, it doesn’t make it easy at all but you have to cope with it. “This thing about having to name a team on a Thursday is crazy because it is such a long time from a Thursday to a Sunday at this time of year with the ‘flu, colds, boys carrying injuries and then you have the Thursday night training session which is where we would do a fair bit of work. Derry currently sit second in the early season table as one of three teams on maximum points alongside table topping Leitrim and Limerick. “We are trying to take it in phases,” added the Oak Leaf manager, “Next Saturday is our first proper away trip in that we have to go to a hotel overnight so we will have to cope with all that before the game.